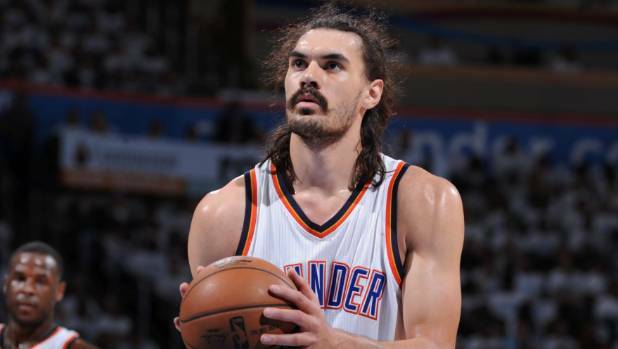 Steven Adams is staying put at the Thunder after agreeing to a $140m contract extension. Kiwi NBA star Steven Adams and the Oklahoma City Thunder have sealed a deal understood to be worth US$100 million (NZ$140m), with multi-year contract extension that makes Kiwi sporting history. The four-year deal will see Adams cemented as the highest-paid New Zealand sportsman, well ahead of racing driver Scott Dixon, golfers Lydia Ko and Danny Lee and rugby player Dan Carter. Oklahoma confimed a "muilti-year contract extension" for Adams as well as Victor Oladipo, who was reported by NBA media to have signed a four-year $US85 million contract. "We are excited to extend our partnership with Steven and Victor," said Thunder general manager Sam Presti. ​"Both players represent the Thunder's present and future, exhibiting the values that the Oklahoma community and our organization hold in high regard: hard work, team first, resiliency and citizenship." The deal had to be done ahead of today's deadline for contract extensions on first-round draft picks from 2013, or Adams would have become a restricted free agent at season's end, which would have required the Thunder to match any offers from other clubs to retain him. With increased cap space expected, getting the deal done now could end up saving the club significant money to retain his services. The 23-year-old New Zealander is earning US$3.1m (NZ$4.3m) this season, the last of his four-year rookie contract. But he will take a big jump in his first major deal on the back of four outstanding years in which he has consistently improved his game with the Thunder. The new agreement is thought to pay him US$6m under the projected max allowed, but is still rated a great deal for both Adams and the Thunder. In 2015-16 Adams started 80 games and averaged 8.0 points, 6.7 rebounds and 1.1 blocks per game. He upped that to 10.1 points, 9.5 rebounds and 0.8 blocks in OKC's playoff run to the Western Conference finals. In three games this season, the first in the post-Kevin Durant era, the 2.13m Kiwi is averaging 13.0 points, 9.0 rebounds and 0.7 blocks per game. He is fresh off a 14-point/12-rebound double-double against the Los Angeles Lakers where he also added two assists, two blocks and three steals to showcase his all-round game. The new deal, when confirmed, will make Adams eventually the highest paid sportsperson in New Zealand, and will also represent the biggest contract a Kiwi athlete has ever secured in professional sport. Adams' Kiwi mentor Kenny McFadden, who started the NBA star along the developmental pathway in Wellington, was rapt but not surprised to hear the Thunder had locked in their rugged centre for the longest term allowable. "It's very gratifying, and it's good for him to feel secure because it's a rough business and it hasn't been an easy road in terms of some of the setbacks he had early with injuries, then Enes Kanter coming in and challenging him, and him having to be able to fight for his position the first year to get on to the court," McFadden told stuff.co.nz. "In terms of how things eventually worked out with Kevin Durant leaving, the pleasing thing is the team is playing well and Steven is part of the formula of success. He's going to get extended minutes and his stats will look a lot better. He's also going to look more and more comfortable as time goes on." McFadden said the Thunder had always liked what they had seen in the raw New Zealander since they picked him with the 12th selection in the 2013 NBA Draft. "They like his work ethic, they have always liked the way he trains, and he's such a good guy in the locker room, and a lot of people don't understand the importance of that. His persona on the court is extremely tough, but he's a joker, he's relaxed in the locker-room and people like to be around him, and that rubs off on everybody. "And on the floor they look at the overall ceiling which is extremely high. We are only in the second or third chapter in a big book. There are a lot more layers to his game in terms of what he can do out ont he court and the intelligence with which he plays." Just hours earlier, OKC also agreed on a four-year US$84m contract extension with guard Victor Oladipo, according to Yahoo's The Vertical. Oladipo, who was the second pick in the 2013 draft, arrived via trade from the Orlando Magic during the off-season and is considered, along with Adams, a major part of the future of the franchise.